What could be better than enjoy a delicious cocktail on Friday evening? After a hard workweek, everyone deserves a little rest. Alcohol is not the only product that relaxes the human body. Marijuana can also relax. Every partier knows that weed cocktails can make any sober as high as a kite. Why not to experience the finer things in life after a hustle and bustle week? Enjoy your Friday with our list of five tastiest cannabis cocktails. Botanical Breeze gets its color of tartness and pinkish hue from hibiscus tea instead of cranberry. Its pleasant color attracts people to taste this weed alcohol drink. Botanical Breeze allows its tastes to amuse a unique and unforgettable taste. This pink colored weed cocktail will make you feel relaxed and satisfied with your choice. Combine all the ingredients and pour into a decanter. Situate some glasses filled with ice. Garnish with a lime wedge or something you prefer the most. 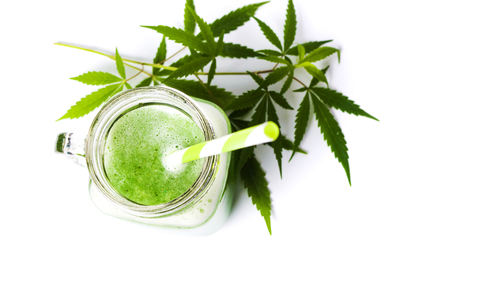 It is easy to prepare this marijuana cocktail. Moreover, a rum with marijuana mixed drink has a great effect on a human. Such a combination can make any sober as drunk as a lord at low doses. Make sure you do not overdo the cannabis because too much marijuana can result in an over-potent infusion! If your weed for the cocktail is moist, you need to dry it out. In order to do it, you have to place your marijuana in an oven for 3 minutes (170°F). It will activate the marijuana's THC to infuse them into your alcohol. Do so before steeping. Grind your marijuana and add rum. Place this mixture in a cool, dim place. Store it there for 4 days, shaking toughly every day. When the fourth day comes, you need to boil a large pot of water. When the water is boiled, turn off the heat. Place the bottle of your weed in alcohol mixture in the pot of boiled water for 30 minutes. Pay attention to the water level, it should not cover the bottle top. Due to the boiled water, the cannabis psychoactive ingredients will be activated. Moreover, those marijuana psychoactive ingredients will infuse the rum. Discard the leaves. Strain the vegetable matter out of the drink. Pour the beverage into a glass and decorate the rum cannabis cocktail to your liking. This marijuana mixed drink was a 1950’s traditional drink, which included ginger ale. Nowadays, it includes not a ginger ale but ginger syrup. The first step includes making the ginger syrup. You need to slice up a finger-sized knob of ginger and remove the peel of ginger. Then put it into a blender. Add some water (if needed) and blend it for 1 minute. Strain out the ginger. You need the ginger juice without pulp. Clean the blender. Place the cannabis syrup, ginger syrup, and lime juice into the blender. Blend the ingredients from 30 seconds to 1 minute. Pour it into a high, ball glass. Add club soda and stir the marijuana alcohol drink. Decorate according to your preferences. Cannabis Vodka is a unique marijuana alcohol drink. The true Cannabis seeds enhance the traditional vodka taste, attracting every stoner. Of course, you can purchase a prepared bottle of cannabis vodka in a certain shop but nothing could be better than a handmade alcohol. Grind your marijuana and add vodka. Place your mixture in a cool, dark place. Store it there for 4 days shaking toughly every day. On the fourth day, you need to boil a large pot of water. When it is done, turn off the heat. Place the bottle of you marijuana alcohol drink into the pot of boiled water for 30 minutes. Pay attention to the water level, it should not cover the bottle top. The cannabis psychoactive ingredients will be activated due to the boiled water. Moreover, those marijuana psychoactive ingredients will infuse the rum. Discard the leaves and strain the vegetable matter out of the mixture. Pour the weed alcohol drink into a glass and decorate the rum cannabis cocktail on your own taste. Cannabis Cup is a refreshing weed alcohol drink. This cocktail raises your spirits up to a minute. The cannabis provides you with a unique relaxing effect. This marijuana and alcohol mixed drink is a perfect decision for Friday’s evening. Blend the cucumber slices, cannabis leaves, and syrup into one mixture. Muddle these ingredients in a cocktail shaker. Add Pimm’s and lemon juice to the mixture and then shake it with ice. Strain the mixture into a chilled Collins glass and fill it up with some ice. In the end, add 1-ounce ginger beer to the top. Decorate this marijuana cocktail whether with a cucumber wheel or something you prefer the most. Start your rest with one of those marijuana cocktails in order to have some fun. Do not deny yourself. Allow marijuana alcohol drinks to provide you with a funny and relaxing effect. It is said that not only marijuana alcohol drinks but also non-alcohol weed cocktails are delicious as well as can cheer everyone up in an instant. Enjoy the end of the hard working week with one of the five tasty cannabis cocktails.